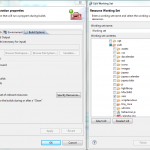 2) Securely erase free space so undelete will not recover anything. On some newer macs, the diskutil utility may not work from single-user mode, so I ended up booting with a Mac OS X upgrade USB (this one was for Mountain Lion for use on another computer) to use the DiskUtil GUI tool to clear the free space. Note that applications will be left intact, so if you wanted to remove anything and tidy up the Applications drawer, you’d have to do this before removing the user profiles. These steps worked for an old G4 Powerbook and the original Macbook Air. Out of the various visual diff tools I’ve used, Meld was the excuse to fire up the NX terminal to Ubuntu instead of using the natively run Windows tools like WinMerge or Kdiff3. Occasionally I’m not on my home network so I needed to find a way to have it running properly on my Windows 7 laptop. Unfortunately it isn’t available as a native Windows application, but it is written in Python with a number of prerequisites. After putting off any changes to my workflow due to the amount of work lately, I recently took the plunge into using the Sass preprocessor / Compass to help make managing stylesheets bearable again. Compass especially serves to give developers access to some lovely sugar, with commonly implemented solutions ready to integrate into your stylesheets – and will seriously reduce the amount of work dealing with different browser differences. There are already many articles about CSS extenders / preprocessors, and without going into the debate of Less vs Sass, the main downside is having to set up the development environment to process the enhanced stylesheets before we can view the results. This installs all the necessary prerequisites. The Compass installation page gives all the necessary steps to get started. With Windows, this is even easier. The rubyinstaller also sets up the paths for you! The remaining steps of installing sass / compass via gem applies. If you already have existing stylesheets, you will want to turn off preset scss files generated by compass with the bare option. You can also direct compass to follow your project’s folder structure. compass install bare --sass-dir "app/pub/sass"
Directories will be created if they do not already exist. A config.rb will be created in your project root that tells compass which folders to scan. See http://compass-style.org/install/ for further guidelines and a nice wizard to guide you in setting up compass. Again, you have to remember to start this process every session. There is a [paid-for] desktop GUI application to deal with this too, but personally, I’d rather not have to think about this! 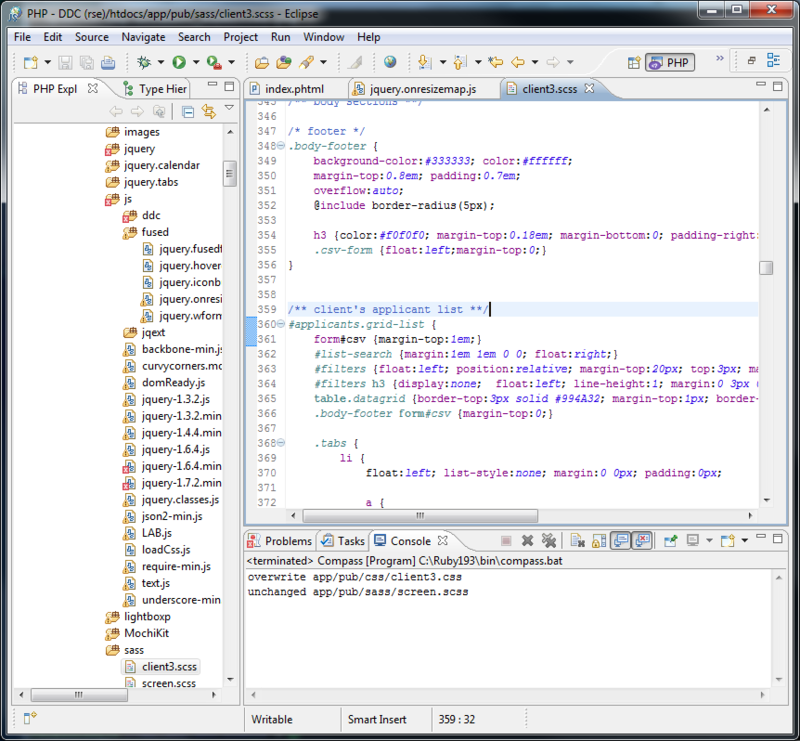 I started looking into methods to automate this within Eclipse. We can break this down: the objective is to run compass after saving the SASS files. One answer that has popped up several times on stackoverload is to write an extension to run an action on the save event – however without proper tooling in Eclipse, this would presumably be another project to consume your time in! There is a solution however in the form of project builders. In our case here, every time we save a file, we can trigger an automated rebuild of this file, and we need Project > Build Automatically to be enabled for this to happen. If not already, open the project property window (Project > Properties), and navigate to the Builders section. 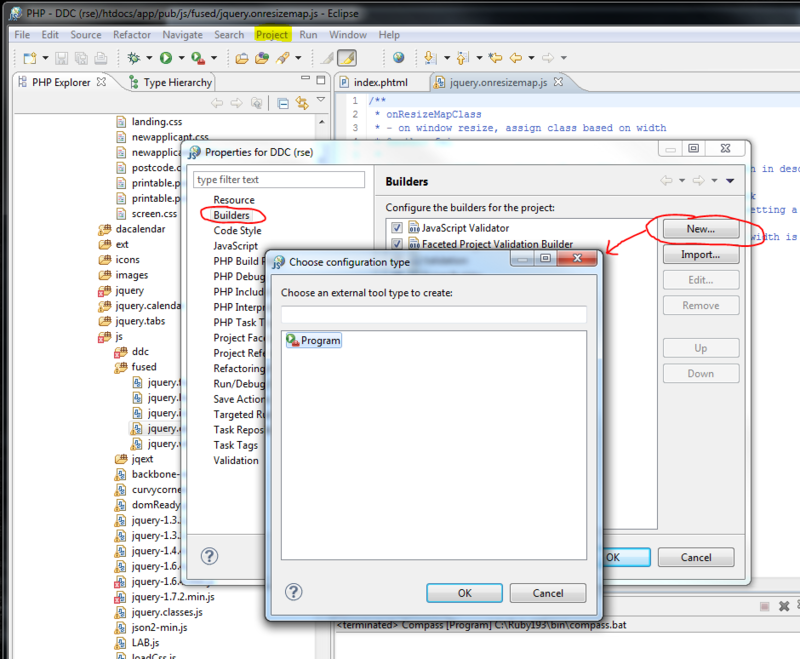 A dialog titled ‘Choose configuration type‘ will appear. Select ‘Program‘, and [OK]. Location: path to compass script. This must either be within the environment path (as set in the Environment page), or be the full path to the gem script. I’ve set this to [C:\Ruby193\bin\compass.bat] in my case. 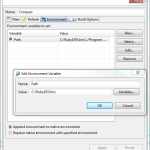 The dialog here will report if the program cannot be located. Working directory: the project path as specified for compass (or where you want sass to operate). Mine is [Y:\ddc\htdocs]. 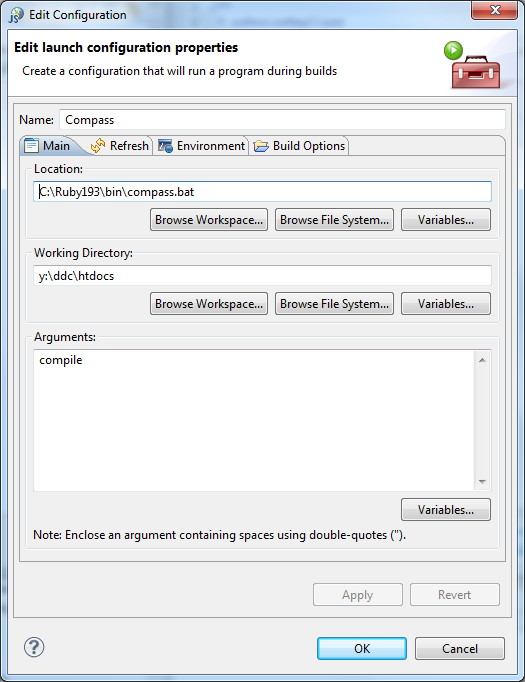 Even though I use RSE to remotely access these files within Eclipse, external apps like Compass requires an actual filesystem path. 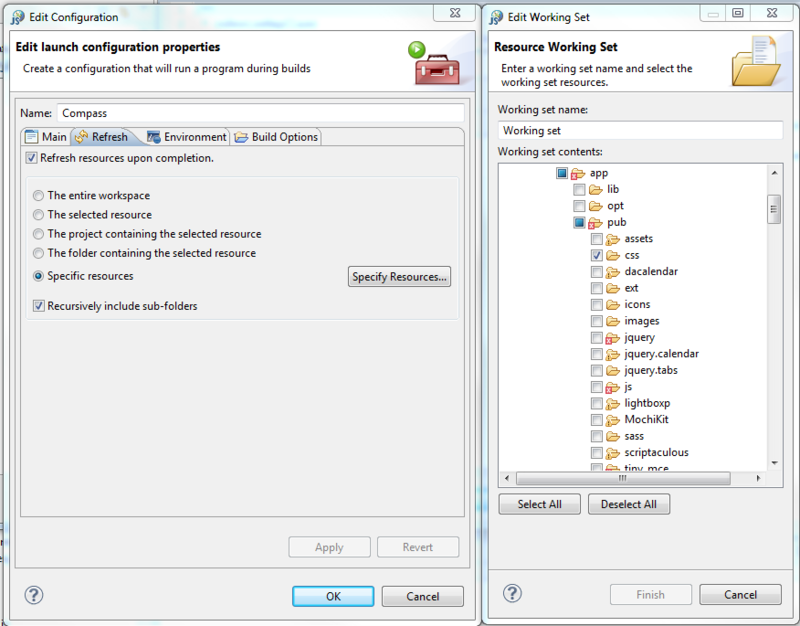 Refresh specifies what you want to do after the program has finished compiling. I would like Eclipse to recognise the updated css files! ‘Specific resources‘ is set to the output folder where the css files are saved to – in my case [app/pub/css] is ticked. Path – here, compass.bat would not run as Eclipse could not find ruby.exe, so the ruby/bin path had to be setup (in fact, I copied this from the Windows environment settings). Note it’s likely that this would not apply to Linux or Mac environments. Build Options – what triggers this builder? plus miscellaneous. Run the builder: [After a clean], [During manual builds], and [During auto builds]. ‘Specify working set of relevant resources‘ [checked] – set this to the sass source folders – in my case, [app/pub/sass]. Any changes found in this folder will trigger this builder. When all done, [OK] the configuration. The new builder should appear as the last item of the list. 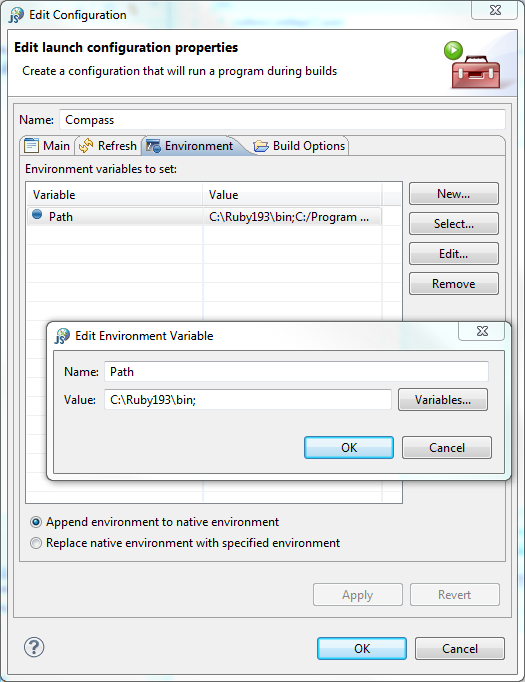 Make sure that Project > Build Automatically has been ticked in the menu to enable automatic compiling. The easiest way to test the new builder is to open the console panel, and create/edit a SCSS (or SASS if you prefer) file, and save within the sass folder. 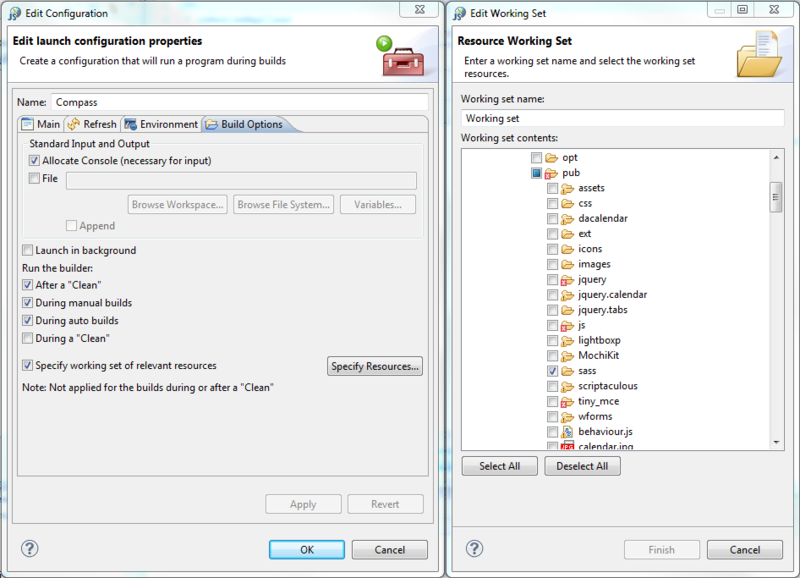 If everything is working, ‘building workspace’ should appear in the status bar, and the console should display the program path, and the results. 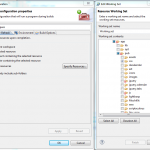 The icing on the cake – you only have to perform this once for each project instance!